Thank you so much for all of your kind words yesterday and for filling out our survey. It has been one of the most fun and creative years of my life. Oh, what's that? You missed the whole survey thing? Well, here ya go! Just click here. And thank you! 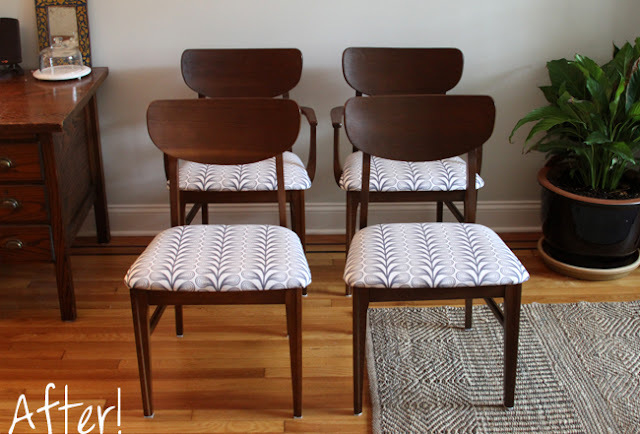 Lori emailed me a pic of some chairs with the message "Hey do you like these? I am at an auction, and looks like something you'd like". Before I saw it and could respond there was another email: "Hey, I bought you those chairs, no worries if you hate them, we can just craigslist them". What? I liked them a lot and saw potential, but wait. 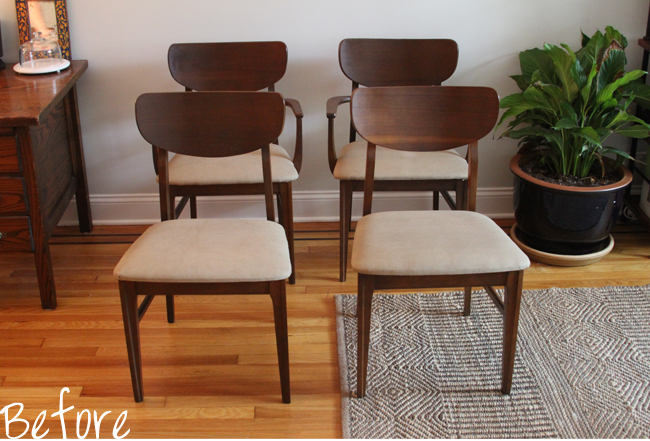 Do I need 4 new chairs and will they fit into my apartment? YIKES. But then I read the fine print. For all of them. Not. Each. Two with arms two without. What to do next. They didn't work with our kitchen table, but we DID want a new desk chair. Hmmm. But really, those worn and stained seat covers have got to go. Buy fabric? Hmm, we guess. But we don't even know what room these are for. All the sudden Nick quietly suggests: What about the old IKEA duvet stuffed in the closet? Could that work? And here are some pics of our process, which was supah dupah easy. The other one without arms is just outside my closet to catch the clothes that I toss in that general direction. The other two with arms are currently pushed up against that same wall in the "after" picture. I think they are great for extra seating during gatherings. Staple Gun: $0. Already owned. Psst: I HIGHLY recommend everyone buying one who cant sew. Cleaning/refinishing supplies: $0, since we already owned them. Ya see, Lori loves gum. And her favorite color is purple. Enter a field trip to the famous Economy Candy and BOOM. Love! The chairs look great! 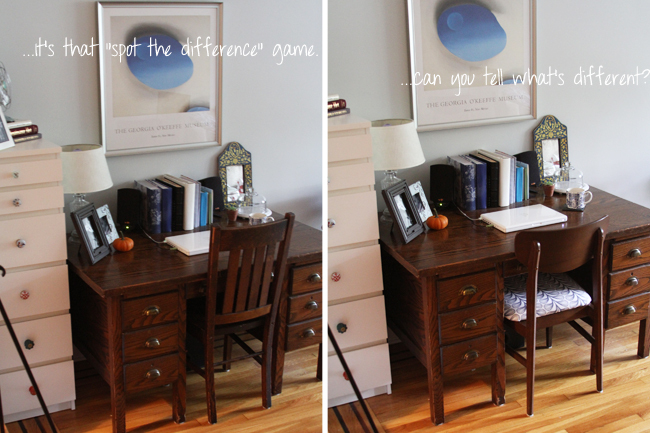 Whoa - I do not recognize those chairs! So glad they are working and seriously - if they are taking up too much room you can still ditch extras (I mean you might make a profit now that they're famous and all!). The gum was a special magical treat and while I might save the vintage purple packages for home decor, I indulged in some delish Fruit Stripe last night, brought me back to 1992. Question - can you tell me a little bit more about what you did to the wood? I see the products but what about the order? 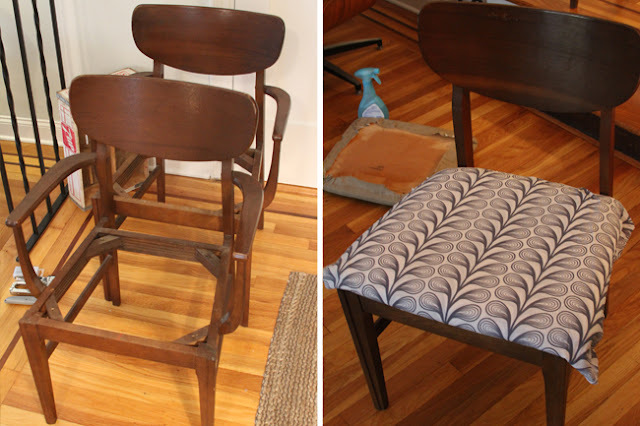 I bought a wardrobe at the same auction and I'm debating painting white vs "refinishing"/touching up the wood and the wood on the chairs looks awesome! We do this process all the time. Even on our floor recently to remove a big scratch. I want to go auctioning with Lori!!!!!! Thanks for the info! Perfect. D - you're welcome to auction with me in NH anytime (and don't tell but I only ever go with my mom who's way more furniture savvy than I).